Early Booking SALE! DOG FRIENDLY LUXURY! BEST RATES FOR CHADWICK ESTATE VILLAS! New townhome with all ensuite baths, exceptional amenities, pool & hot tub! 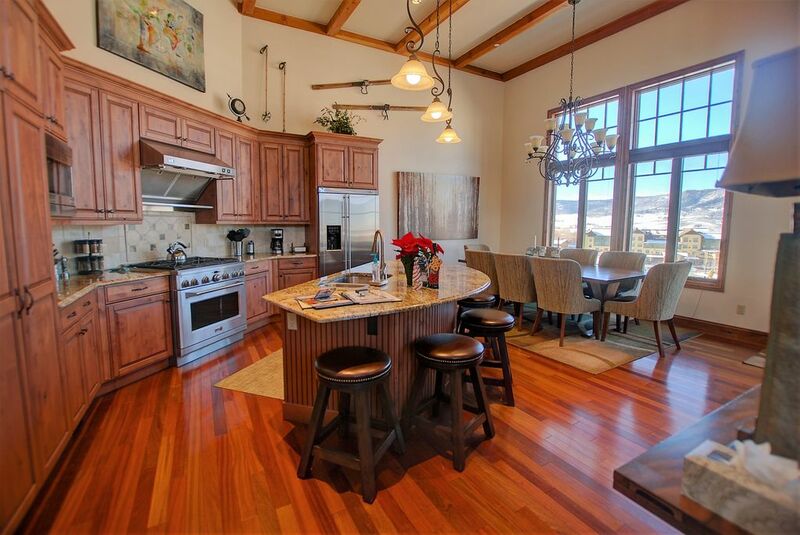 You simply can't beat the rates for this luxury 4 bedroom town home in Steamboat Springs. It is loaded with amenities and priced WAY lower than anyone around. And we allow DOGS! It is conveniently located less than a mile from the Steamboat Resort base and it comes with 2 ski lockers just steps from the Gondola for added convenience. NO LUGGING SKIS BACK AND FORTH! If needed, there is on-call shuttle service provided by GoAlpine to get you to and from the mountain once a day. All bedrooms have private bathrooms and TVs, so everyone in your group will enjoy their stay. We have robes, exceptional linens, XBox, giant tvs with surround sound, private hot tub (that even has an outdoor heater installed to make the trip in and out oh so nice), games, movies, steam shower, a fully loaded kitchen...the list goes on! Read on for more info! Enjoy the exceptional property amenities including the outdoor heated pool and hot tub, sauna, and fitness room; or take in the views from your private deck with grill and private hot tub. Relax in the comfortable living room or in the entertainment room with wet bar! The home has a Sonos sound system, a very high end tech package, plush towels and the finest bedding including Egyptian cotton sheets and Downlite down comforters. There also is a heated driveway and heated two-car private garage. Morningside Villa is the BEST of Chadwick Estate Villas. It is finished with the finest materials, including beautiful stone fireplaces, granite and stone slab counter tops, and premium rustic hardwood finishes. The bathrooms feature ceramic tile, a steam shower and large bathtubs. The gourmet kitchen is outfitted with a large fridges, stainless steel appliances and gas stove. This is truly the way to go when you travel to Steamboat. Lots of space, all the amenities, and the best complimentary concierge services in town! Want to bring your dog? Give Wendy a call! "Truly a first class experience. Perfect for our crew which included 2 families -- 3 adults and 5 kids + 1 small dog. Where to begin? 1) Wendy called early in our travel day to make sure we had directions and get our ETA. I called her when we were 5-10 minutes out and she met us as we drove up to the house. 2) She gave a great walk through; showed us where everything was, how little but important things worked (TV, hot tub, etc) and gave us all the necessary codes/phone #s. 3) The house is fabulous. Other similar homes in the area are well into the seven figure asking price. It is large, well built and the fit/finish are top notch. All help to make it a VACATION. It does not stop there. 4) The little things matter too. Towels are really good. Pool is a short walk but having the hot tub off one of the bedrooms is soooooo nice. All the beds are comfortable. Sonos sound system (actually works!) and makes that large TV room a lot of fun. 5) The kitchen is actually, fully stocked! A lot of places say they are, but we all know there are not. This one has everything from sharp knives, a great coffee maker, plenty of salt, sugar, Pam, etc. and even had all the necessary cooking pots/pans. It even has a crock pot. Toyed with the idea of not telling you all this so we could try to keep it for ourselves....we will be back. Thanks for everything, Wendy." High end luxury Steamboat Elite Heavenly Beds. All white sheets, down comforters and duvets. DVDs include Harry Potter series and several other excellent films. Loved the house; the experience couldn't have been easier. Great management. Everything with the house worked perfectly and was setup the way one would set their own home up. Well appointed and great location to gondola!! Only issue.. wish we stayed longer! Wendy our host was amazing! Amazing house with all the amenities and space. Management company was very helpful. Would stay here again 10/10. Great location, beautiful house and extremely warm welcome. We stayed in the house over Christmas and new year. Wendy was so helpful supporting us throughout the festive period. The skiing was amazing with lots of champagne powder. Everyone in Steamvoat springs was very friendly making it a must visit location. This home is a great place for a family get together! It is so well equipped and each bedroom has it’s own bath so you really are able to have privacy. The neighborhood is great for walking. The beds are very comfortable and the master bath is like a private spa! The common areas are perfect for gatherings! Can’t say enough about the many special details of this home! Highly recommend. We'd like to keep this place a complete secret, but that would not be fair to Wendy and company. We appreciated that she met us at the condo and gave us a few ‘how to’ instructions. Morning Side Condo was perfect for our summer stay. Our family of 8,and 2 small dogs, enjoyed all the common spaces - a beautiful, high end kitchen, wonderfully comfy couches and chairs, the pleasant decks and views, the hot tub, Sonos Wireless Sound System, and the spacious entertainment room! Each was special in its own top-notch, perfect way. Our family also loved our private space in one of the 4 ensuite bedrooms. The beds were all extremely comfortable, with added touches such as quality linens and towels. The master bedroom was the best of any we have ever stayed in! My husband and I loved how well the home was constructed. Despite activity going on in the entertainment room, we could not hear it in the master bedroom. We hope to visit again this Winter! Morningside Villa is located less than a mile from the base of the Steamboat Resort. All discounts offered based on 5+ nights. Ski season on-call shuttle service is included for a once daily round-trip to the Steamboat Resort via Go Alpine. For best service, reservations should be made in advance. A $750 pre-authorization on a valid credit card is required per the terms of the rental agreement to cover fees incurred or fines levied due to over-occupancy, violations of HOA rules, etc.